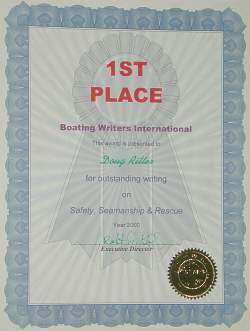 Equipped To Survive Editor Doug Ritter was today awarded first prize in the 2000 Boating Writers International Annual Writing Contest in the category of Safety, Seamanship and Rescue. The prize was won for the five-part series of articles, "Life Rafts: The Good, Bad and The Ugly," that appeared in Belvoir Publications' Practical Sailor and Powerboat Reports magazines. Doug Ritter is now the Safety and Survival Editor for these Belvoir publications. Wrote one of the judges about the Ritter articles, "You have to admire the amount and quality of research that went into the preparation of these articles. It takes what seems to be a confusing subject and, as the title says, separates 'the good, the bad and the ugly' of life rafts. Comprehensive, organized and entertainingly informative." Information about the testing of these life rafts can be found in the article "Life Rafts in the Desert." The detailed and expanded version of the Marine Life Raft articles which won this award will be presented on Equipped To Survive this coming Spring. The results of the testing of Aviation Life Rafts has already been published on ETS. Doug noted, "I am honored to have this significant work recognized by my peers. None of this would have been possible without the considerable support of Belvoir Publications and in particular, Editorial Director Tim Cole and my editors, Dan Spurr and Chris Landry. In addition, credit must go the all my good friends and the volunteers, businesses and organizations who helped bring this project to fruition, there is no way it could have been done without their considerable hard work and contributions. Finally, the support of my wife Sue, without whom none of this would ever get done, is sincerely appreciated." Boating Writers International is the premier international association of boating writers and journalists.